Thank you for your interest in pH Amp. Please complete and submit the form below and an ADInstruments representative will aim to get in touch within one working day. If you’d like to speak to someone immediately, office contact information is available from the contact page. The pH Amp is a dual front-end suitable for use with pH, ion-selective and potentiometric redox electrodes. 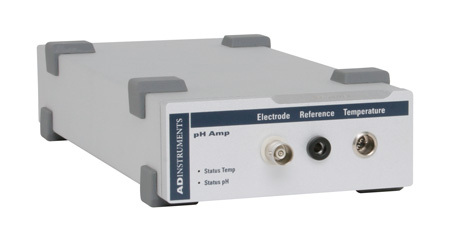 The pH Amp is a dual front-end suitable for use with pH, ion-selective and potentiometric redox electrodes. The unit is capable of measuring pH in the range 0-14, electrode voltages to 2.0 V and temperature in the range of 0 to 100 °C. It can also be used for temperature compensated measurements or as an independent temperature sensor. The unit is supplied with a RTD Temperature Probe.